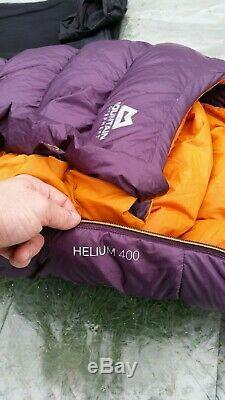 Mountain Equipment Womens Helium 400 Ultralight Down Insulated Sleeping Bag. Women's Size Regular Colour Blackberry LH zip. Max width at shoulder 75cm. Bag Weight using my scales 830g. 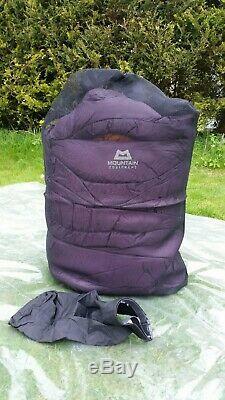 A fantastic Ultralight Down bag in beautifully clean used condition inside and out. No marks or stains , no odours. Very minimal signs of use. 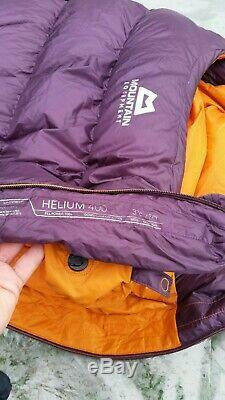 Shell material is ultralight highly breathable Helium nylon fabric and the inner lining is a very soft and comfortable supersoft nylon. The bag interior has a lovely luxurious feel to it. 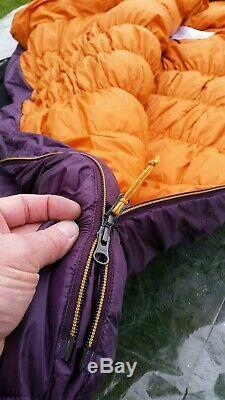 The two way zip is ideal for ventilation on milder nights. 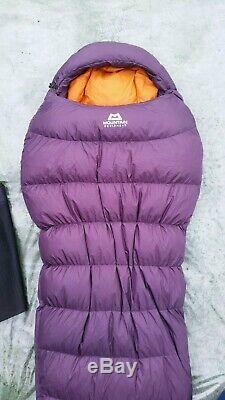 It is a very warm bag given how light it is and you can rely on it at freezing point. 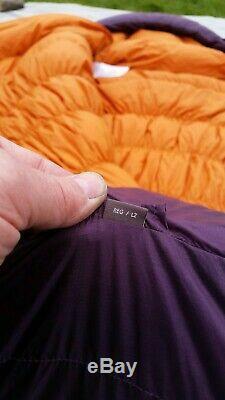 Insulation is top quality Down as always used by Mountain Equipment in their down bags. 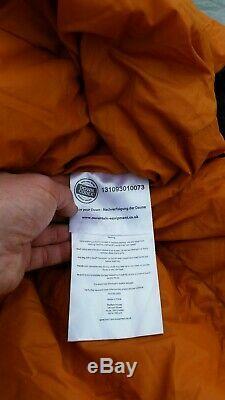 Ethically sourced and traceable using the Down Codex system. 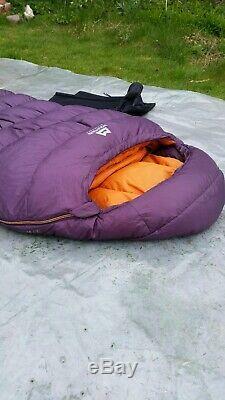 There is a drawcorded hood and insulated neck and shoulder baffle which will cinch down to keep out any draughts. 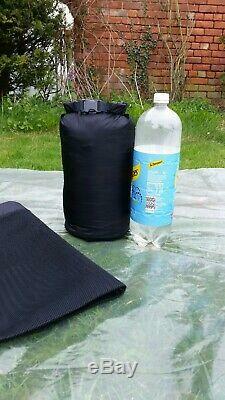 It comes with a mesh sack to store it in and retain loft during storage and a waterproof roll top stuffsack for packing. 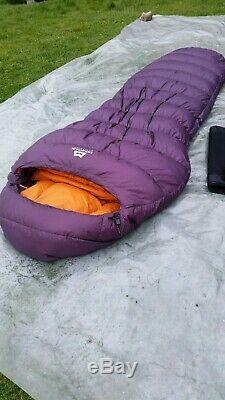 Perfect from spring through to autumn for mountaineers, backpackers or general camping. 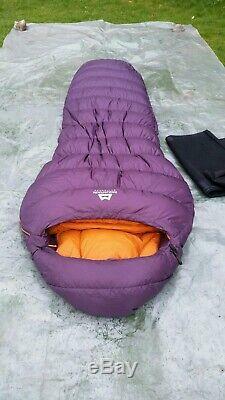 Specification HELIUM 20D outer shell is very light and highly breathable 385g of 90-10 Pure Duck Down with a minimum fill power of 700 Alpine fit maximises thermal efficiency Slanted Box-Wall baffles throughout Mid-level side seams 5 baffle anatomically shaped hood 4 baffle anatomically shaped and offset foot-box Full length Gemini zip baffle and integrated collar with Lode Lock closure Please see online and the Mountain Equipment website for further information. Thank you for looking and reading. The item "Mountain Equipment Women's Helium 400 Ultralight Down Sleeping Bag Immaculate" is in sale since Sunday, April 7, 2019. 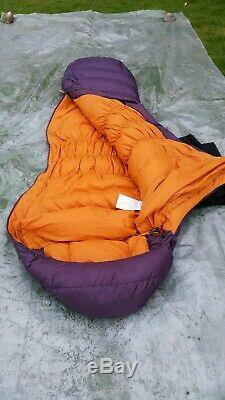 This item is in the category "Sporting Goods\Camping & Hiking\Outdoor Sleeping Equipment\Sleeping Bags". The seller is "jo-4188jo" and is located in Horncastle. This item can be shipped to United Kingdom, Antigua and barbuda, Austria, Belgium, Bulgaria, Croatia, Cyprus, Czech republic, Denmark, Estonia, Finland, France, Germany, Greece, Hungary, Ireland, Italy, Latvia, Lithuania, Luxembourg, Malta, Netherlands, Poland, Portugal, Romania, Slovakia, Slovenia, Spain, Sweden, Australia, United States, Canada, Japan, New Zealand, China, Israel, Hong Kong, Norway, Indonesia, Malaysia, Mexico, Singapore, South Korea, Switzerland, Taiwan, Thailand, Bangladesh, Belize, Bermuda, Bolivia, Barbados, Brunei darussalam, Cayman islands, Dominica, Egypt, Guernsey, Gibraltar, Guadeloupe, Grenada, French guiana, Iceland, Jersey, Jordan, Cambodia, Saint kitts and nevis, Saint lucia, Liechtenstein, Sri lanka, Macao, Monaco, Maldives, Montserrat, Martinique, Nicaragua, Oman, Pakistan, Paraguay, Reunion, Turks and caicos islands, Aruba, Saudi arabia, South africa, United arab emirates, Ukraine, Chile.